Fly to the Sky is a South Korean R&B duo comprised of singers U.S.-born Brian (Korean Hangul: 브라이언) and South Korean native Fany (also known as Hwanhee; Korean Hangul: 환 희 Hanja: 歡喜; meaning “delight”). The duo was formed in late 1998 by SM Entertainment Group, which is considered the largest and most influential pop music entertainment label in South Korea. SM Entertainment has brought out many K-pop legends as H.O.T, 동방신기, 신 화 , S.E.S., and BoA. The duo debuted in 1999 at the LOG-IN H.O.T show and the SM Festival Concert ‘99. Since then, they have achieved some popularity within the U.S., China, Taiwan, Singapore, and South Korea. Fly to the Sky has also been awarded several accolades. These include MTV Asia’s “Artist of the Month” in 1999, M.NET Music Video “Festival’s Best R&B Artist” in 2003, and SBS Gayo Daejun’s “Best R&B Artist” in 2004. 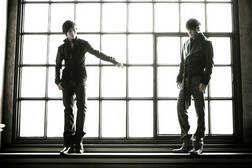 The members of Fly to the Sky has also participated in business outside of the duo. This includes making use of Brian Joo’s native English speaking skills by having him conduct formal MTV and other music channel interviews with American pop celebrities. These singers include Mariah Carey, Britney Spears and Christina Aguilera. After the group’s contract with SM Entertainment expired in November 2004, Fly to the Sky signed on with PFull Entertainment. This company also produces work of ex-member of S.E.S., Eugene. The duohave already done a concert named, “Fly to the Sky: 2006 The Twice Tour” at Jamsil, Seoul on Jan. 29th, 2006. Also, they currently are in Korean TV shows such as Happy Sunday, Heroine 6, Love Letter, XMan, and Star Golden Bell. In addition, Brian has been an MC for MBC’s show, “Music Core” since May 6th, 2006.